Hash qualified from Bristol Dental School in 2000 and went on to complete Vocational Training and two years as a hospital dentist in Maxillofacial Surgery at the teaching hospitals in Sheffield. After a year travelling and working in Australia, he started his specialist training in orthodontics at Cardiff University and gained his M.Orth. and Masters degree with Distinction in 2008. 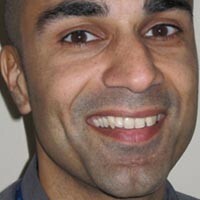 During this time he was awarded the Geoffrey Fletcher Research Scholarship from the British Orthodontic Society. Following this, Hash spent a further three years in advanced orthodontic clinical training between Cardiff and Swansea, and was appointed as an Orthodontic Consultant in 2011. Hash is also a Royal College of Surgeons examiner for the MFDS and a member of local and British Orthodontic Society bodies. He is currently completing a PhD in 3D facial imaging and his interests include the multidisciplinary treatment of skeletal disproportion and the management of cleft lip and palate. Hash has had numerous specialist publications and written book chapters but overall is a clinician who strives for the highest standard of clinical outcomes.